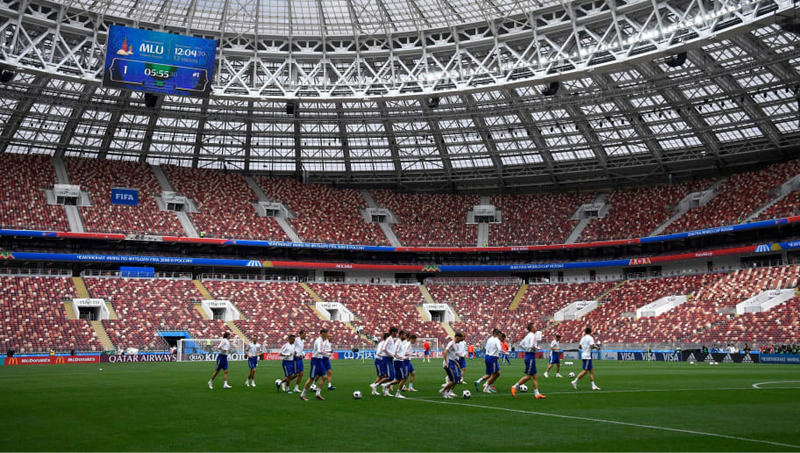 The ​World Cup will finally get underway on Thursday afternoon with Russia set to face Saudi Arabia at the Luzhniki Stadium in Moscow. Stanislav Cherchesov's side, who qualified automatically for the tournament as hosts, have been handed a favourable draw, with Group A consisting of Russia, Uruguay, Egypt and Saudi Arabia. A - Based on our World Cup predictor, Opta give Uruguay (59.1%) the best chance of progressing from Group A at the 2018 @FIFAWorldCup. Tenacity. Saudi Arabia qualified for their fifth World Cup as runners-up in Group B, finishing behind Japan but ahead of Australia on goal difference (although the Aussies did eventually qualify via the playoffs). Both sides will fancy their chances of securing an early and vital three points on Thursday, in the first ever encounter between the two nations. Russia head into the tournament on the back of an awful run of form, having won just five of their last 26 games. The Russian Football Union had organised two pre-World Cup friendlies against Austria and Turkey in the hope that victories against either side would instil some confidence ahead of the tournament, but the Sbornaya fell to defeat against Austria and could only draw with Turkey. ️We take a closer look at who will be key for @TeamRussia when the action kicks off in two days' time! Saudi Arabia's recent form - or lack of it - may not look too dissimilar from their opponents, but the Green Falcons have showcased some impressive performances of late, most notably against Germany in their final World Cup friendly last Friday. Unlike Russia, they've had the advantage of playing in competitive games. They recorded six wins and three losses from their ten games in Group B, scoring 17 goals (the most along with Japan) and conceding 10 in the process. The hosts are the lowest FIFA ranked team heading into the tournament. Saudi Arabia were the lowest ranked team to qualify for the tournament, although they are now ranked 67th, three places above Russia. Stanislav Cherchesov will be without two of his preferred centre backs in Georgy Dzhikiya, who tore his knee ligament in January, and Viktor Vasin, who suffered the same injury whilst playing for CSKA Moscow in February. Zenit St. Petersburg forward Alexander Kokorin will also be missing from Russia's squad after he too tore a knee ligament back in March. Saudi Arabia will be without one of their star players in Nawaf Al-Abed. The 28-year-old attacking midfielder, who plays his club football with Al Hilal in his home country, has struggled with a foot injury since January. There's no pressure on the hosts to win the World Cup, but fans will be expecting to see at least one victory on home soil. A fast start is thus vital for Russia, not only to encourage support from the home crowd, but to also inspire some confidence in a team who hasn't won since June of last year. Lev Yashin is the face of the 2018 #WorldCup . . .
Saudi Arabia, on the other hand, will be happy to sit back and attack on the counter. The Green Falcons have a host of pacy players who will look to exploit Russia's lack of pace in defence and midfield. That could work out if they take the lead.